Low solubility product of alkaline nature containing boron, calcium and sodium. The addition of Ubor to materials that fuse to form new chemical bonds with the silicon oxide by the thermal shock resistant material. With metal oxides form metal borates that lower the melting point more than the oxide. Ceramics During the preparation of the glass frit, the Ubor 15, when heated forms chemical bond links of B2O3 to SiO2, this addition affects the material properties increasing resistance to thermal shock. Manufacture of vitreous glazes, where a main component is the glass frit. Metallurgy as an antioxidant in the smelting and refining of copper, tin, brass and bronze. The Ubor 15 reacts with oxides forming metal borates. Free molten metal oxides. 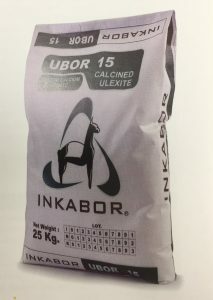 Abrasives The Ubor 15 is an ingredient in the preparation of abrasive material, when heated it forms chemical bond links of B2O3 to SiO2, this addition affects the material properties increasing resistance to thermal shock and lowers the melting point of the mixture of materials. Manufacture of abrasive materials such as sandpaper of different grains and materials.